From Las Vegas to Singapore, multi-talented he has been entertaining showroom audiences from all over the world. A master Elvis Presley Look Alike Impersonator Tribute Show, with a powerful voice, a striking presence and a love for performance he commands a warmth and charisma that always delivers a gracious response. His look, dynamic style and stage experience led him to performing Elvis Presley Look Alike Impersonator Tribute Show at the Los Angeles Hilton, the Hollywood Improv, Las Vegas’ MGM Grand, the Tropicana’s Magic Movie Hall of Fame as well as Harrah’s Hotel & Casino. His passion for music developed from his early years as a professional drummer playing in his own bands as well as other musical venues. Elvis Presley Look Alike Impersonator Tribute Show was also inspired by the image of actor, singer, dancer John Travolta who became “one of my heroes.” Experiencing the thrill of the disco scene, he soon recognized he had a natural feel of dance which proved to be a terrific asset to his stage performance and audience rappor His”Vision of Elvis” is a full show that takes the audience through the eras of the king. 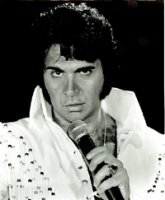 His incomparable tribute to the King of Rock n’ Roll, Elvis Presley Celebrity Look Alike Lookalike Impersonator Tribute Artist has become so popular that he has gone out on his own and has become one of the most sought after entertainers to have recreated the look, the sound and excitement that made Elvis a legend. 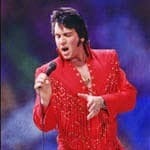 Elvis Presley Celebrity Look Alike Lookalike Impersonator Tribute Artist.